Music is becoming a social experience thanks to the Internet. Music services like Spotify and Rdio let us see what our friends are listening to. Music videos are shared on YouTube. You can add bands as friends on Facebook. And now, social network Twitter is getting into the social music game with the launch of Twitter #music, a music discovery app. Twitter #music is a socially powered Top 40, allowing you to instantly see what artists and songs are most popular on the social network. 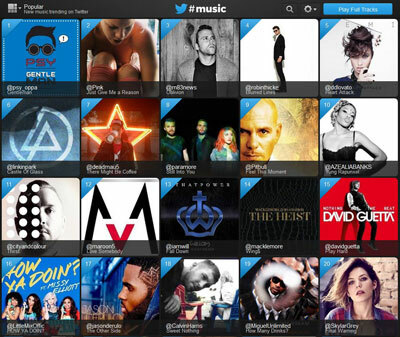 It also allows you to keep track of musicians you and your Twitter friends follow. If you subscribe to Rdio or Spotify, #music can be linked to your account, allowing you to play full tracks straight from the app. Currently, Demi Lovato’s song Heart Attack is in the number one spot in the Popular listings. In the Emerging list, Scottish band The Pastels takes top honors. The Suggested section left a bit to be desired – mine is populated with both the wholesome Clay Aiken and 80’s heavy metal group Pantera. The music discovery app is free, and currently available for download on iTunes. No Android version is available yet, though Twitter says a version is coming “over time.” A web version of #music is also available.